EdTech coaches sharing and discussing EdTech content within our schools and districts. In this episode of the EdTech PodSquad, we discuss how we would change what we did as educators within the classroom with all of the information we have now. Be sure to checkout the show notes at bit.ly/edtechpodsquad Thank you for listening! In this episode of the EdTech Podsquad we discuss the value of EdTech Certifications. Are they really worth the free advertisement we give to these companies? Find out our thoughts within the show. Catch up on some new tips and be sure to come see our next episode recorded LIVE at #METC19! You should also come to Philly in June to see us at #ISTE19! We are presenting a panel and a poster session. We hope to see you at any of these sessions! Stickers will be available at all! Show notes are found at bit.ly/edtechpodsquad Follow the #EdTechPodsquad on Twitter to keep the conversation going! Episode 10 - Do I Really Hate My Future Self? 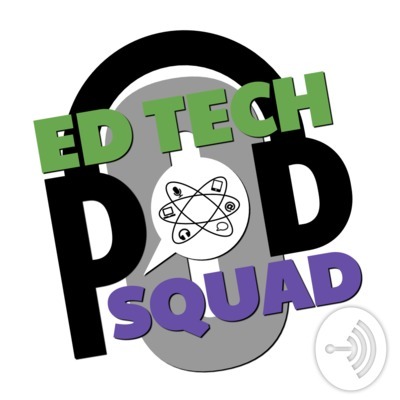 Welcome to another episode of the EdTech PodSquad! Summer has flown by and for many the new school year is right around the corner (if you haven't already begun!). Enjoy this back to school episode from your favorite 5 Missouri EdTech Coaches. Be sure to checkout the show notes at bit.ly/edtechpodsquad Connect with each of us on Twitter! Like what you hear? Then like us on iTunes or your favorite podcast player and please share with a friend! Thank you for checking out our 5th episode! This is a special episode as Erin, Sam, JP and I were at ISTE18 when we recorded it. Josh was unable to attend, but was able to join us and moderate the episode. Finding a quiet place to record at ISTE is no small task, so we apologize as the sound quality is not the best. We share a bunch of take-aways from our ISTE experience. Be sure to check out the show notes at bit.ly/edtechpodsquad for information! Also be sure to follow these hashtags: #ISTE18, #NotAtISTE18, #METCpd Not able to make it to ISTE? METC is a premier affiliate of ISTE. Our annual regional conference every February attempts to provide our participants with the ISTE conference feel at a MUCH smaller scale! This wouldn't be possible without our presenters! If you are interested in presenting at #METC19, go to metcedplus.org and click on the proposal submission link! Deadline is fast approaching! Don't miss your opportunity to share your knowledge with 2,000+ educators.